This season has captured the relationship dynamics of the super family of Superman, Lois Lane and Jon, half superhero comic and half day-time soap opera. Issue #6 marked the introduction by Superman of his son to the Justice League members of Batman and Wonder Women. The previous segment switched smoothly between family drama and the action sequences of Superman encountering a robotic enemy in the Eradicator. The adversary was defeated in a spectacular issue #6, with a fight-scene certain to live long in the memory. Issue #8 will commence proceedings with a new segment in the season, with the inaugural episode “Return to Dinosaur Island” kick-starting this latest event, it will be out on October, 5th. 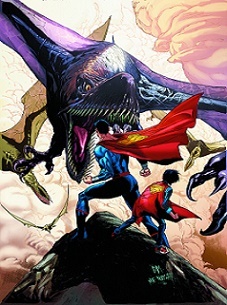 Kal-El and his son will again co-feature and take center stage in the episode, with both transported to a prehistoric island crawling with dinosaurs. A scientific experiment gone wrong is the explanation behind the teleportation. Now Superman and Jon need to defend themselves against giant, man eating dinosaurs. A departure from the earlier story arcs, but expect the character development established as a recurring theme to be continued. Superman has began to teach his offspring about the correct use of his super abilities and balance with an ordinary life, we can anticipate more of this tutoring. Peter Tomasi, the primary scripter for this season, is penning the episode, with artist Doug Mahnke returning to craft the imagery. Issue #8 “Return to Dinosaur Island” will be released on October 5th, 2016.